An unique radiological appearance of a rare tumor of ribs. ACPM Medical College, Dhule – 424001, Maharashtra. India. Introduction: Osteochondromas (exostosis) are the most common neoplasm of bone and arise from the metaphysis of bones. Tumors of the chest wall comprise approximately 2% of all tumors of the body and may be primary or metastatic, benign or malignant. Osteochondroma is a common bone tumor but a rare tumor in the rib. It is often asymptomatic and observed incidentally. The tumors typically begin to grow before puberty and continue until bone maturation is reached. Surgery is required in childhood if these lesions are painful or disfiguring, while those arising in adulthood should always be resected. 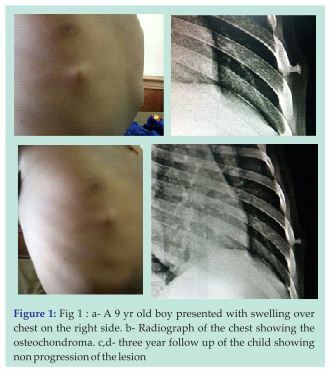 Case Report: 9 yr old boy presented to OPD with swelling over right chest. Radiograph showed bony outgrowth on the lateral aspect of the 6th rib. The patient was kept under closed observation and was treated conservatively. Three years follow-up didn’t show any increase in the size of the swelling and the patient did not have any complaints. Conclusion: Though various studies have shown that the surgical resection of osteochondroma is necessary to avoid further complications of Haemothorax, pneumothorax or intercostal neuralgia, we concluded that osteochondroma of the ribs can even be conserved if not associated with complications and patient does not need to undergo unnecessary surgery. Keywords: Exostosis, Rib, Tangential view. 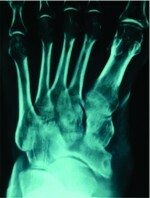 Exostosis of a membranous bone is extremely rare. Exostosis of the bone is a common finding in children presenting with a mass in the extremity. These are benign bone tumors characterized by cartilage capped bony outgrowths that project from the surface of the affected bone. They may be found in any bone that is formed in cartilage but are seen mostly in metaphyseal portions of long bones. Osteochondromas are benign developmental abnormalities in which a portion of the epiphyseal growth plate cartilage becomes separated from the main epiphysis. A 9 yr old boy presented with swelling over chest on the right side. The skin over the swelling was normal. It was painless and non tender and fixed to the rib anteriorly (Fig 1). The swelling was initially pea size and then progressed gradually over a period of 3 yrs to attend the current size (0.5 cm in diameter), which remained constant. The swelling was lobulated, having smooth surface, bony hard in consistency and fixed to the bone. The skin above was free and movable. It was not associated with any pain, tenderness, rise in local temperature at the site, any respiratory problems and swelling at other sites. Chest radiograph (Tangential view) was done which showed bony growth over the 6th rib on the lateral aspect (Fig 2).Osteochondroma of the rib was suspected as it did not increased in size since last few years as per the history given by the patient. We now have a 3 yrs follow up of the patient without any complication to the patient. The swelling didn’t increase in size and remained constant (Fig 3 & 4). As he is a male child and the bony growth is on the lateral aspect of the chest on the right side, cosmetic reasons are also omitted. As the lesion was not painful or disfiguring, we treated the child conservatively. 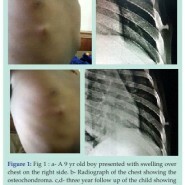 Exostosis of rib is very rare, the incidence being 1 in 50,000 children. Neoplasms of anterior and posterior chest wall present diagnostic and therapeutic problems, which are often unique to the region body. Primary neoplasms of the chest wall are 5% and 10%, neoplasm of ribs being far more common than those of sternum. Osteochondroma of the rib is exceedingly rare [1,2,3]. They may present as a swelling in the chest wall or as an incidental finding on the chest radiograph. Osteochondroma usually presents in childhood or adolescence. About 3% of solitary osteochondromas have vertebral and costal origin while they have been said to occur in 7% of individuals with hereditary multiple exostoses. Gadolinium enhanced MRI can be useful to differentiate benign from low grade malignant cartilaginous tumor. Cartilaginous tissue in the cap is known to have high signal intensity on T2-weighted MR images and the size of the cartilaginous cap is the best indicator of malignancy . Tumors of the chest wall comprise approximately 2% of all tumors of the body and may be primary or metastatic, benign or malignant. Approximately 60% of the resected tumors are primary . Sixty per cent of primary tumors are malignant and mostly are of bony origin. Only 10% of rib tumors are benign and osteochondromas, the most common benign bone tumor, account for half of these . The tumor occurs more frequently in men, with a male/female ratio of 3:1. Osteochondromas begin in childhood and grow until completion of skeletal maturity. Differential diagnosis for rib lesions include enchondroma, osteoblastoma, osteoid osteoma, chondroblastoma, haemangioma and chondrosarcoma. Most are symptomless but complications associated with this tumor include fractures, osseous deformity, vascular injury, neural compression, and malignant transformation . Spontaneous haemothorax, diaphragmatic rupture, pneumothorax associated with rib exostosis has also been reported [8,9]. It has been speculated that bleeding arises from pleural vessel enlargement caused by chronic irritation by the inwardly growing mass. Exostosis of membranous bone like scapula, ribs and clavicle is extremely rare. In our case, the exostosis was of the 6th rib on the lateral aspect. After 3 yrs follow –up, the patient didn’t had any complaint except the bony hard swelling on the right side of the chest. It was painless and not disfiguring. Thus we considered conservative management. Large number of rib tumors are malignant and no rib swelling should be ignored. We concluded that Benign rib tumor is a very rare condition and can be treated conservatively unless associated with cosmetic problems or any complications. Conservative treatment has excellent results without any complications. Benign tumor of rib is very rare. Though rare it should be evaluated cautiously when presented to OPD. If asymptomatic these rib exostosis can be conserved. Surgical exploration and resection is the treatment of choice when associated with complications. 1. Kikuchi R, Mino N, Matsukura T, Hirai T. Resected osteochondroma of the rib in an elderly patient. Gen Thorac Cardiovasc Surg 2010;58:588-91. 2. Tateishi U, Gladish GW, Kusumoto M, Hasegawa T, Yokoyama R, Tsuchiya R, et al. Chest wall tumors: radiologic findings and pathologic correlation: part 1. benign tumors. Radiogra- phics 2003;23:1477-90. 3. Lee CY, Ham SY, Oh YW, Lee SH, Kim KT. Osteochondroma arising from a rib mimicking a calcifying anterior mediastinal mass. J Korean Radiol Soc 2007;57:533-5. 5. Cemil M, Purut MD. Lesions of the Chest Wall. In: Sabiston DC, Lyerly HK, ed. Text Book of Surgery, the Biological Basis of Modern Surgical Practice. 15th ed. Philadelphia, USA: WB Saunders, 1997; 1896-97. 6. Pairolero PC. Chest Wall Tumors. In: Shields TW, ed. General Thoracic Surgery, 4th ed. Malvern, PA, Williams & Wilkins, 1994; 579. 7. Murphey MD, Choi JJ, Kransdorf MJ, Flemming DJ, Gannon FH. Imaging of osteochondroma: variants and complications with radiologic-pathologic correlation. Radiographics 2000;20:1407-34. 8. Bini A, Grazia M, Stella F, Petrella F. Acute massive haemopneumothorax due to Solitary costal exostosis. Interact Cardiovasc Thorac Surg 2003;2:614-5. 9. Glass RB, Norton KI, Mitre SA, Kang E. Pediatric ribs: a spectrum of abnormalities. Radiographics 2002;22:87-104. 10.Uchida K, Kurihara Y, Sekiguchi S, etal. Spontaneous Haemothorax Caused by Costal Exostosis. Eur Respir J 1997; 10: 735-6. 11.Harrison NK, Wilkinson J, O’Donohue J, et al. Osteochondroma of the Rib: An Unusual Cause of Haemothorax. Thorax 1994; 49: 618-9. 12.Teijeira FJ, Baril C, Younge D. Spontaneous Haemothorax in A Patient with Hereditary Multiple Exostoses. Ann Thorac Surg 1989; 48: 717-8. 13.Buchan KG, Zamvar V, Mandana KM, etal. Juxtacardiac Costal Osteochondroma Presenting as Recurrent Haemothorax. Eur J Cardiothorac Surg 2001; 20: 208 10. 14.Balastskii AV, Ruisnouwich UE, Reshetrikova UK. Case of Traumatic Haemothorax in a Child with Multiple Cartilaginous Exostoses. Pediatriia 1973; 52: 82-4. 15.Solitary osteochondroma of rib. A Case Report. Phatak SV, Kolwadkar PK, Rajderkar D. Ind J Radiol Imag 2006 16:3:339-40. 16.Teijeira FJ, Baril C, Younge D. Spontaneous hemothorax in a patient with hereditary multiple exostoses. J Am Acad Orthop Surg Mar-Apr 2005;13:110-20. 17.Hajjar WM, El-Medany YM, Essa MA, etal. Unusual Presentation of Rib Exostosis. Ann Thorac Surg 2003; 75: 575-7. 15.Rodeo SA (2007). Biologic augmentation of rotator cuff tendon repair. J Shoulder Elbow Surg 2007;16:197S-191S. January 28, 2015 Giant Cell Tumour of Distal Fibula Managed by En Block Resection and Reconstruction with Ipsilateral Proximal Fibula.